Every time we return home and unlock our front door, we get that comforting feeling of being at home. First steps into the hallway, we breathe in that homely air and we know here is where we feel good. What a nightmare when the smell is rather musty! Such smell sends alarm bells ringing, warning you that there’s mould at home. Mould growth has a negative effect on our health and comfort of living and it is usually detected only late on, as it is often hidden behind furniture, wallpaper or woodwork. How do mould fungi develop? At what humidity levels does mould develop in rooms? What other factors favour mould growth? Finding the causes of mould: Where does the moisture come from? How can I determine the dew point? How can I measure surface temperatures? How do I recognize that there is a risk of mould? What can be affected by mould? What damage is caused by mould? Which types of mould are there? Can mould make you ill? Mould spores are found everywhere in our environment as they are natural components of the air. Mould also gets into our living and working spaces, carried by our clothing and through ventilation. But it is only with ideal climatic conditions that this most annoying housemate can settle in permanently in our home and infest walls or other items. 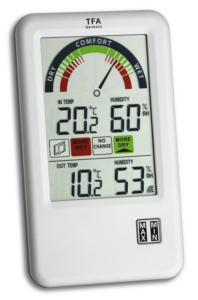 The regular monitoring of the relative humidity and room temperature with a thermo-hygrometer, plus targeted heating and ventilation can help prevent mould growth. The term mould means in the jargon the cotton-like coating on surfaces and objects caused by mould growth. Commonly, we use this word to refer to both the growth and the fungi themselves. In order for mould to spread, a lot of moisture is needed in combination with the right temperature, sufficient nutrients and the right pH levels. The fungi find a suitable breeding ground on almost all organic materials. When moulds are in the growth phase, they are barely visible. The fungus consists of white filaments called hyphae. A group of hyphae is called in the specialist literature mycelium. The fungi spread through spores, which are part of the hyphae. Generally, a damp environment favours mould growth. At a relative humidity of 70 to 80 per cent mould grows. Mould fungi find ideal living conditions in all areas where condensation is present. Now the ambient temperature comes into play as it determines how much water vapour the air can absorb: the colder it is, the less moisture the air can hold. Decisive for the formation of condensation is the dew point. If the air cools down below the dew point, but the moisture content remains the same, excess water vapour condenses on surfaces that are cooler than the dew point temperature. If the relative humidity in the middle of a room is 50 per cent, this same relative humidity can be up to 100 per cent on cold spots such as poorly insulated windows, corners of buildings or inside roller shutter boxes. This creates the ideal breeding ground for mould spores and fungi. Temperature plays a major role in mould growth as it affects relative humidity. Apart from that, most moulds thrive in a very wide range of medium temperatures: black mould, for example, grows as well at 6 degrees as it does at 45 degrees. Mould fungi like organic substances. This includes many building materials, but also fibres, hair and shed-skin flakes, which are all found in house dust. The nutrient supply influences how fast mould can spread. Adequate temperatures and enough nutrients in the form of building materials are found especially in our living and working spaces. With the addition of appropriate humidity levels, fungi growth is now fully supported. Mould thrives at pH levels between 2 and 11. Thus, these fungi are very resistant and can multiply in both alkaline and acidic environments. In damp rooms, applying a strong limewash is an additional countermeasure. We always read about how walls and basements in old buildings are damp and full of mould. No wonder, as in most cases they are not sufficiently insulated, there is a presence of rising damp on walls, outer walls with cracks or there is a leak coming from the roof or gutters. However, mould growth can also occur in newly built houses or renovated buildings for example, due to improper insulation, or thermal bridges (aka cold bridges). Even extremely well-insulated houses may end up being affected by mould growth if there is a lack of proper ventilation and heating of interiors. In previously flooded areas, water damage is the main reason for mould growth on walls. Increased humidity is not always due to structural conditions or external water. Simple daily activities such as drying clothes, showering, bathing or cooking can release an average of six to twelve litres of water each day into the atmosphere. The more people there are in a household, the more activities are performed and as a result the more water vapour is released into the air in the course of the day. Indoor plants and aquariums also increase the humidity levels of a room. Whether the causes of mould and moisture-laden rooms are due to building defects (e.g. poor workmanship), or water damage (e.g. leaking gutters), the first step to take is to try to solve the problem by seeking the professional help of an expert. Otherwise, targeted ventilation and heating are the best way to regulate humidity and temperature levels inside rooms. However, anyone who is not consistent enough in his/her approach may encourage mould growth. 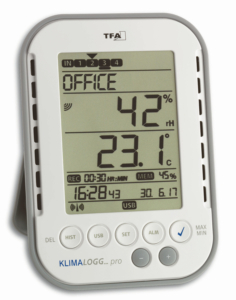 An indispensable instrument that may help you with this task is a thermo-hygrometer. 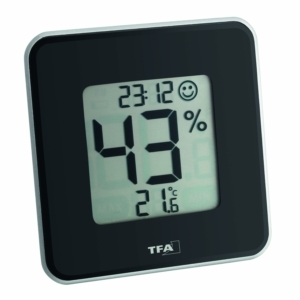 This device displays both values for temperature and humidity and it helps you to identify the right time to ventilate you home or adjust the thermostat. A room temperature of 18 – 22 ° C and a relative humidity of 40% – 60% is perceived by most people as pleasant and it is also ideal for the fabric of the building. Check the values in the living room and bedrooms regularly to reduce the risk of mould. Moisture levels above 60% favour the growth of mould fungi. Now it is time to open the windows for a rapid ventilation, e.g. in bursts. This will send the moisture-laden air out whilst allowing fresh air to enter the building, thus allowing a complete exchange of air. Ventilation is by far the most effective way to avoid mould. Depending on the season, the air outside can be sometimes drier and sometimes wetter than the one indoors. You can also ventilate your home on a raining day to reduce the relative humidity in your rooms when the outside temperature is low, as cold air can only absorb little moisture, whilst warm air absorbs much more. When cool air from the outside enters the house and gets heated, it can absorb more moisture and reduce the relative humidity in the rooms. 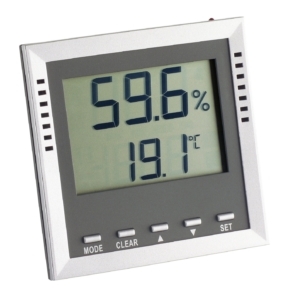 It is important to keep an eye on the interaction between temperature and humidity. 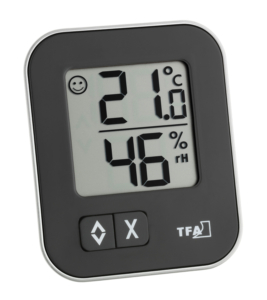 This job can be made easy with the help of a wireless thermo-hygrometer with ventilation recommendations. 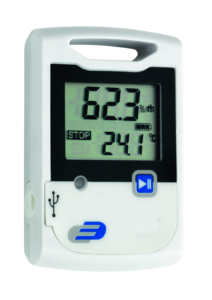 This instrument measures the outdoor climate in addition to the indoor climate and compares the values, so it is an indispensable tool for mastering correct ventilation. Another important factor on how to ventilate correctly is to consider what the room is used for. After showering or bathing, for example, ventilation with a window wide open is always recommended in order to send the moisture outside via the shortest route. Further tips on correct ventilation are, for example, to ventilate unused rooms regularly or to remove water droplets after showering by drying the bathroom walls with a towel or a squeegee. In addition to the bathroom, the bedroom is particularly susceptible to mould growth, since the recommended temperature in this room should be kept between 16 and 18 degrees – the ideal temperature for a healthy sleep. In addition, the humidity is greatly increased by breathing and sweating – we release up to a quarter of a litre of water into the ambient air during sleep. That’s why targeted ventilation is so important in this room. This way mould doesn’t get a chance. After ventilation, adequate heating, i.e. regulating the thermostat, comes as the second most important thing to do to prevent mould. By heating, we increase the temperature of the ambient air and at the same time, the surface temperature of furniture and walls. If the absolute water vapour content remains constant, the relative humidity decreases at the same time, thus minimising the chance of mould to occur. But care must be taken with targeted heating: an overly dry air can also be damaging to our health as well as to plants and animals. 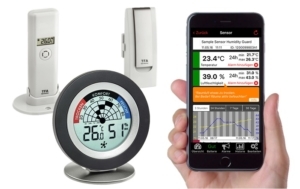 A weather station can help you to monitor the temperature and humidity in several rooms and prompt you to take action in the way of target heating or ventilation. To prevent mould growth, the air temperature should not drastically decrease in any spot of a room as to prevent reaching the dew point. This should be avoided at all costs. If the temperature falls below the dew point, water droplets form on cold surfaces around the house and there is an increasing risk of mould fungi growing in these same places. This is when a thermo-hygrometer with dew point display can help. Monitor the dew point. 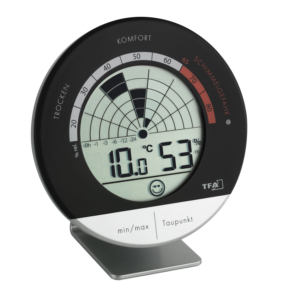 Preferably, the temperatures of wall surfaces should not decrease below the displayed value. 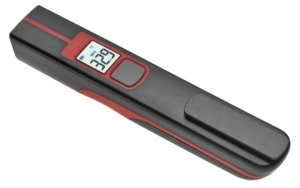 Check the temperature of critical places such as ones with thermal bridges. 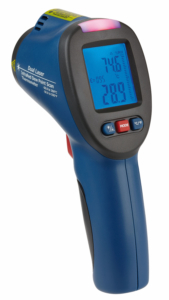 This can be easily done with the help of an infrared thermometer. 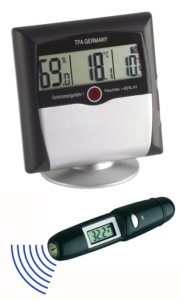 There are also combi tools such as thermo-hygrometers and sets that can simultaneously measure the dew point and surface temperatures. What is important in relation to heavily cooled exterior walls and thermal bridges is that the heated air indoors can circulate freely. If furniture is placed too close to potentially cold spots on walls, moisture cannot escape. In general, mould occurs mainly in places that are covered and thus poorly ventilated, for example, behind skirting boards, bathroom cabinets, kitchen cupboards, wardrobes and wall panelling. 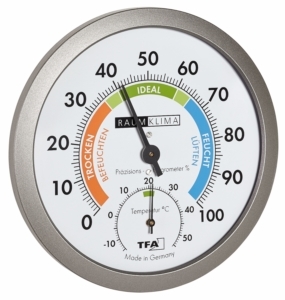 Many tenants and landlords cannot agree when it comes to determine the right combination of temperature and humidity, and this is often a cause of dispute between them. 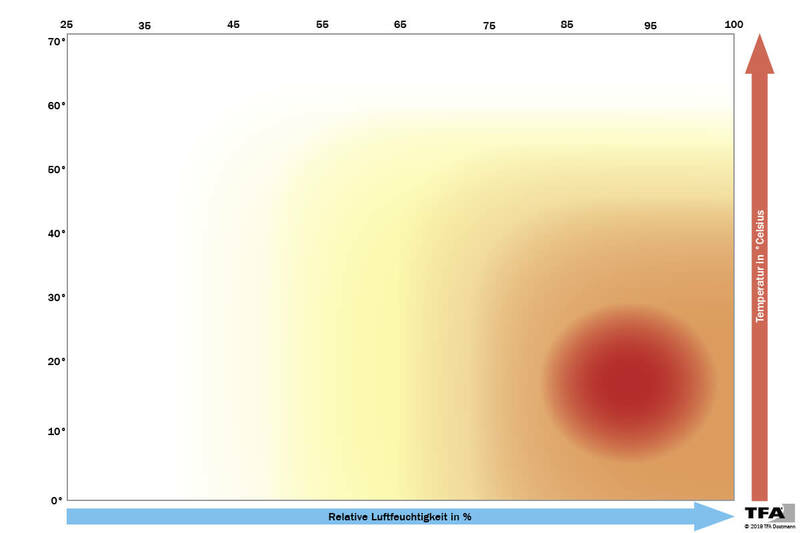 Once mould is detected, the conflict immediately begins on “who is to blame.” In this case, a thermo-hygrometer with data logger function helps to record the course of the measured values over a long term. 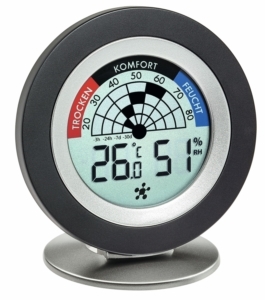 This allows the temperature and humidity values to be monitored and recorded over a certain period, thus providing you with reliable data do defend your argument. For people who store sensitive and valuable items, keeping the ideal temperature and humidity values is also very important. Data logger functions are also the solution in this case too. All materials containing organic substances (nutrients) and sufficient moisture. GGlass, metal and ceramics can become mouldy if the surfaces are contaminated with organic matter. This can be a mixture of dust, shed-skin flakes, hair and fibres. Wallpaper, plaster walls, paper, leather, textiles and other natural materials are particularly vulnerable to moisture. Moulds fungi need increased humidity to grow, so mould predominates in areas that are covered and poorly ventilated. For example, skirting boards, cabinets and panels. There are countless types of mould in our environment and new ones are constantly being discovered. When we talk about mould in the home, five types are usually meant. The most widespread type of mould found in a household is the green mould. The furry coating is characteristic and often occurs on food and potting compost. However, in damp rooms such as kitchens, basements and bathrooms, walls and ceilings can also be affected. Another type of mould commonly found in households is the red mould. This fungus species thrives in sugar or starchy environments. It attacks mainly grains, flour and wallpaper. Black mould is the most harmful to health. This fungus is very resistant and undemanding and can thrive in an ambient temperature between 6 and 47 degrees. This fungus likes both acidic and alkaline environments with pH levels ranging between 1.5 and 9.8. Most commonly, we find this type of mould between tile joints, brick walls, interior walls and ceilings. Nuts, cereals and soil in potted plants are common places for this strain of fungi. The grainy surface varies in colour between ochre yellow and brown. Yellow mould is also known as slime mould. Cold and unheated areas on ceilings and behind furniture are the favourite places of white mould. When this fungi specie is found on walls, it is often confused with salt efflorescence. In the course its growth, the white mould becomes darker and only then it is properly recognized and identified. If you notice woodlice, silverfish bug, barklice or a musty odour in your rooms, you already have proof of a moisture-laden environment. From now on if you detect spots with a whitish surface, you can assume that it is mould. The inhalation of mould spores can cause allergic reactions and make existing respiratory diseases worse. Some moulds even produce toxins that are harmful to humans and can cause serious illnesses. Some strains of black and yellow moulds are particularly dangerous. People with a weakened immune system, the elderly, babies and children are particularly at risk if they spend a prolonged time in rooms full of dampness and mould. Respiratory complaints are often attributed to overly dry air. But care must be taken if you intend to increase the humidity levels. If mould is already present, higher humidity levels will promote mould growth further. 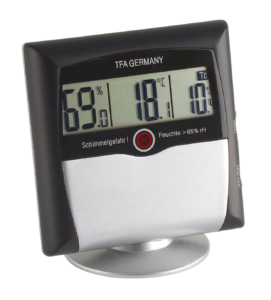 We therefore recommend that you check the room climate values with a thermo-hygrometer. If mould is suspected, it is best to proceed with further investigations. You can consult experts in this area and even mould detection dogs can be used for this task.